Hello ladies! Welcome to the first post of the new feature – Sample Corner. 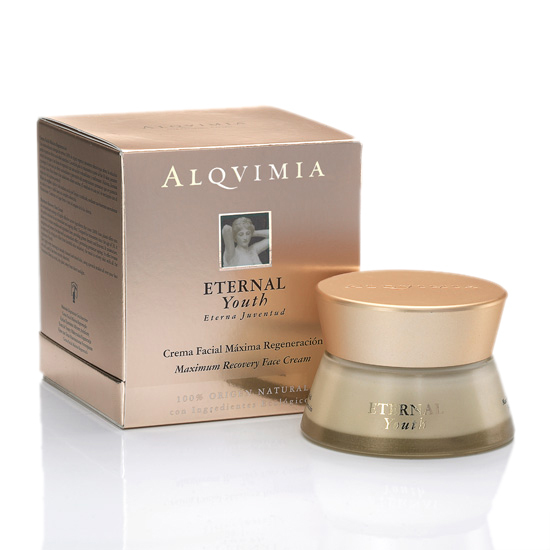 Today I will present to you the sample for Alqvimia Eternal Youth Maximum Recovery Face Cream. As you know, I came across this brand (check out detailed post on it HERE) in the beauty exhibition I visited (check the detailed coverage HERE) and the lady present there gave me this sample to try out from their line. The quantity is quite less ie it is only 3ml and it lasted me for 5 applications on my face only. Lets break down some basics first. “An extraordinary synergy of highly effective active ingredients that come 100% from plants offers you the perfect solution for an immediate anti-ageing effect. Designed for treatment beginning at the age of 30, it allows to reduce wrinkles and expression lines, creating greater density and firmness. 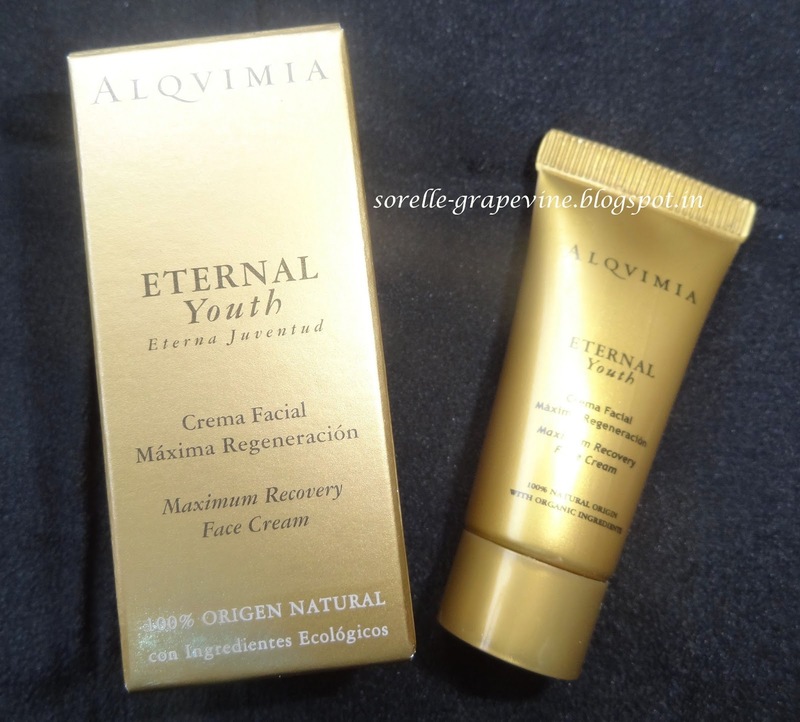 It moisturizes, enlightens and protects the skin with an antioxidant effect, preventing premature ageing that is reinforced by acting as a filter from harmful solar radiation. The result is velvety skin with all the brightness of youth. Water (aqua), Glycerin, Prunus amygdalus dulcis (sweet almond) oil, Glyceryl stearate, Cetearyl alcohol, Limnanthes alba (meadowfoam) seed oil, Simmondsia chinensis (jojoba) seed oil, Pongamia glabra seed oil, Potassium palmitoyl hydrolized wheat protein, Caprylic/capric triglyceride, Crambe abbyssinica seed oil, Persea gratissima (avocado) oil, Triticum vulgare (wheat) germ oil, Butyrospermum parkii (shea butter) extract, Citrus medica limonum ( lemon) peel oil, Cymbopogon martini oil, Citrus aurantium dulcis (orange) peel oil, Aniba rosaeodora (rosewood) wood oil, Pelargonium graveolens flower oil, Pogostemon cablin oil, Styrax tonkinensis resin extract, Beta-glucan, Palmytoil hydrolyzed weat protein, Rubus idaeus (raspberry) seed oil, Oxycoccus palustris seed oil, Robinia pseudacacia flower extract, Viola odorata flower oil, Boswellia carterii oil, Commiphora myrrha oil, Citrus aurantium amara ( bitter orange) flower extract, Xanthan gum, Titanium dioxide, Zinc oxide, Pongamol, Levulinic acid, Sodium levulinate, P-anisic acid, Diacetin, Tocopherol, Lecithin, Ascorbyl palmitate, Glyceryl oleate, Citric acid, Limonene*, Geraniol*, Citronellol*, Linalool*, Citral*, Benzyl benzoate*. Quite impressive type of claims from them. Btw this gem retails for about $230 (approx Rs. 12650/-) for 50 ml of product. Very expensive deal. But the whole concept of the brand is that they are not about products but rather a lifestyle. It is very hard for me to describe the smell to a T. A complex blend that gives you spicy notes at one sniff and rich floral the next to lemony in the third An exotic energizing fragrance which was quite appealing to me. The texture is like a thick lotion but the nature if it is very rich. I could feel the layer of it on my skin. Given the fact that I have an oily combination skin and that I’m allergic to heat (why I mention this you will come to know…be patient) I decided to apply this every night before going to bed. They advise to apply it every morning which would have been a complete no-no for me especially in summers. Now given my skin condition this cream was too rich for me. It broke me out not only pimples but I got a light rash on my skin. Remember I mentioned that I was allergic to heat…the cream is not reactive or anything and does not become warm but due to its thick layer covering my face my skin would feel slightly warm thereby causing me to breakout the way I did. It did not happen on the first application but gradually in the process of the trial. So not meant for our summers. I would not have such a situation if it would have been winters. Given that my skin became such a state it is very hard to list out any of its benefits…but yes upon close scrutiny now I will say that my expression lines have reduced (not that they were very prominent). It is a very moisturizing cream so people with extremely dry skin will benefit from it and the other skin types should leave this for winters. I personally would not buy this version per say coz a) the price tag and b) I feel the serum will be more suitable for me. I cut the tube to take pics of the product and discovered that I had atleast 3-4 uses left in it. So 3ml of product goes a long way ie approx 10 uses so 50 ml would mean about 167 applications roughly which would cost about Rs. 75 per use….lol maths lesson!!! Anyways those were just some rough figures. I will finish out the tube by giving a gap of some days between each application. Hopefully I will be able to report in some significant results to you in an update. That’s it for this feature at present. Hope you found it useful. Please remember this is just a small window into the properties of the product and by no means justifies the whole deal. So please dont go and judge this on this basic trial run but keep an open mind about it. I will be back with another sample review soon. Till then – take care! Hello my beauties! My sis flew into town last night for a visit after an entire year. None other than the creative & goofy half of this blog aka Dimpy!! She lives in UK and was finally able to find sometime to come and pay us a visit. And look what she got me 😀 My precious much awaited haul!! Some pieces from the MAC Archie’s Girls collection and brushes from Real Techniques. 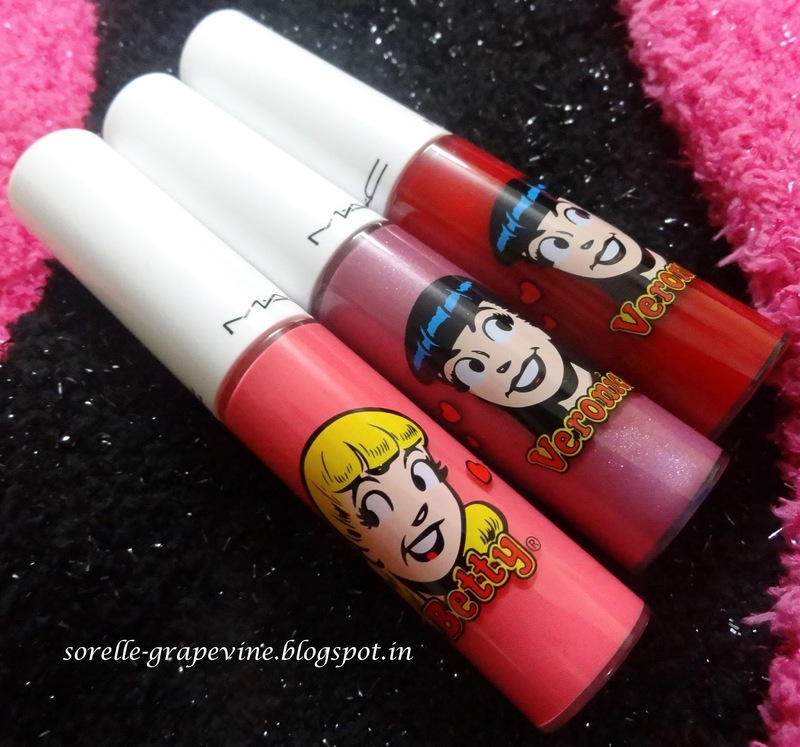 I wanted a head start on the upcoming MAC Archie’s Girls collection as I knew this is much awaited by the MAC enthusiasts and would be sold out as soon as it hit the shelves out here. Kolkata is much worse off coz there is only one MAC counter here and they get very few pieces of an item sometimes like 2-3. So it becomes very difficult to lay your hands on what you want unless you are damn lucky. I picked out these pieces from the collection as soon as it was available online on the MAC UK site and even then I was not able to get some of the lippies and Pearlmate that I was eyeing….they were sold out already. I’m hoping that I can find them when this collection hits the stores out here. But I did get most of what I wanted. 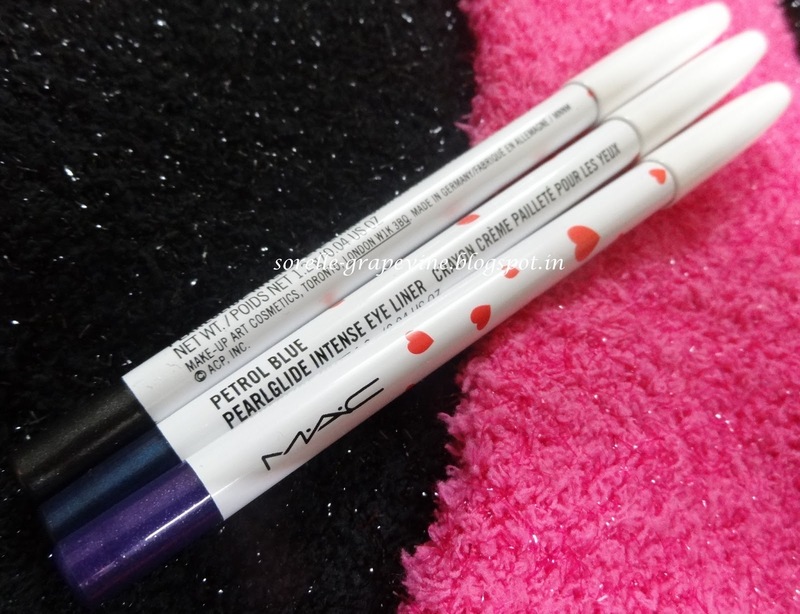 I picked out 3 of the 4 Pearlglide eyeliners – Designer Purple, Petrol Blue and Black Swan. I got one lip gloss from the Betty line – Kiss & Dont Tell, and 2 from the Veronica line – Mall Madness & Strawberry Malt. I also got one lippy from the Betty line – Oh Oh Oh. Detailed info and swatches will be up soon. Apart from those I got 2 brushes from the Real Techniques line – Shading brush & Blush brush. Heard so much about them and of course everyone has heard of the famous vloggers Pixiewoo. Samantha Chapman from this sisters duo has launched these gorgeous brushes which are designed to give you a high definition and “pixel perfect” look. Details coming soon. Honestly I feel like such a kid-in-candy-shop right now. I was so excited to get my hands on these and just cant wait to play. So excuse me while I go and drown myself in these beauties. Will be seeing you soon with posts on all the displayed pieces….so keep watching this space for more……Ciao!